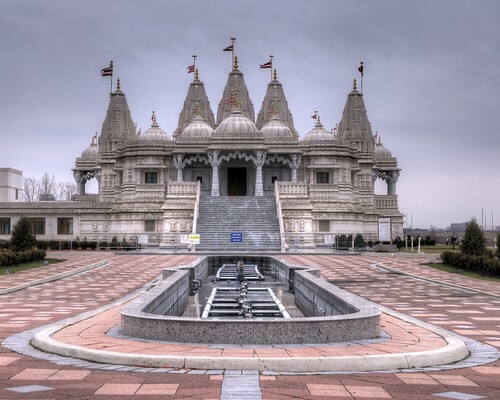 BAPS Swaminarayan Mandir, originally uploaded by Gregory Pleau. This structure is built with over 10,000 tons of marble, sandstone, granite and limestone. It features delicate carvings throughout. The Hindu Mandir is easily the most recognizable landmark to be seen from the 427 north of the 401. It’s an amazing place to visit, and it is open to the public to visit. There’s a geocache nearby that will help you find the complex – GC2NCRX. The photo is an HDR image, which brings out some of the texture in the sky and the structure. I will have to come back in the summer when the fountain is running. Baps swaminarayan temple is very nice. This temple is very nice. this temple is not but all temple is very nice.